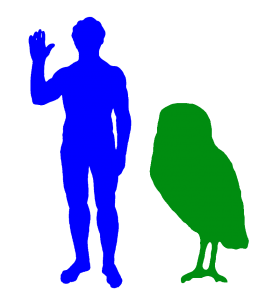 The Cuban Giant Owl or Giant Cursorial Owl (Ornimegalonyx) is an extinct species of giant owl. It went extinct about 9000 years ago. Its fossils were discovered on the island of Cuba. It is the biggest ever owl. This giant owl was about 1.1 m (43.3 inches) tall. This giant owl could only fly short distances, like a a modern wild turkey, or possibly not at all. It probably weighed more than 9kg (20lb). It had very long powerful legs, a bulky body and a short tail. It was a powerful runner. In short, they preferred to run rather than to fly, unless it was forced to. They nested in the caves and hunted for rodents and ground sloths in the forest. They were able to kill prey weighing more than 35kg.